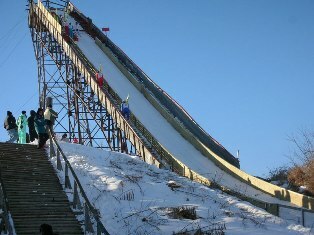 On the evening of February 1, 2013 International ski jumpers will take the sky under the lights at the annual Snowflake Ski Club’s 118K ski jump tournament in Westby, Wisconsin. This year’s event celebrates 90 years. The tournament concludes on Saturday with International and US jumpers competing on the large hill, often traveling down the jump with speeds in excess of 50 miles per hour. Here are the details: Friday, February 1st, Opening Ceremonies: 7 pm, followed by jumps. Fireworks and Live Music: 9p.m. – 12a.m. Saturday, February 2nd, Opening Ceremonies: 12:00 p.m. followed by jumps. Live Music: 3-7 p.m. The ski jump complex at Snowflake consists of five jumps all located in the same area of beautiful Timber Coulee. The largest is a 118 meter Olympic-sized hill used for national and international competitions. The Large Hill Meet is held early each year in February and attracts not only U.S. ski jumpers but competitors from around the world. The four smaller hills at the site include a 65 meter hill, Many Olympic and world-class ski jumpers have competed at the Snowflake Ski Jumping Complex. Westby House Inn’s location is just 5 miles from the jump and well worth the stay to take in the Friday and Saturday events. Wake up to a hearty breakfast to get you warmed up and ready to enjoy this wonderful winter event. Perhaps a whirlpool room is the perfect way to top off a well deserved winter weekend getaway. The volunteer based Club members donate many hours preparing and grooming the hills. The snowmaking and grooming equipment keep the hills in good condition regardless of natural snowfall. The show does go on with real fluffy stuff or not! Plan now to attend!